new-home construction. 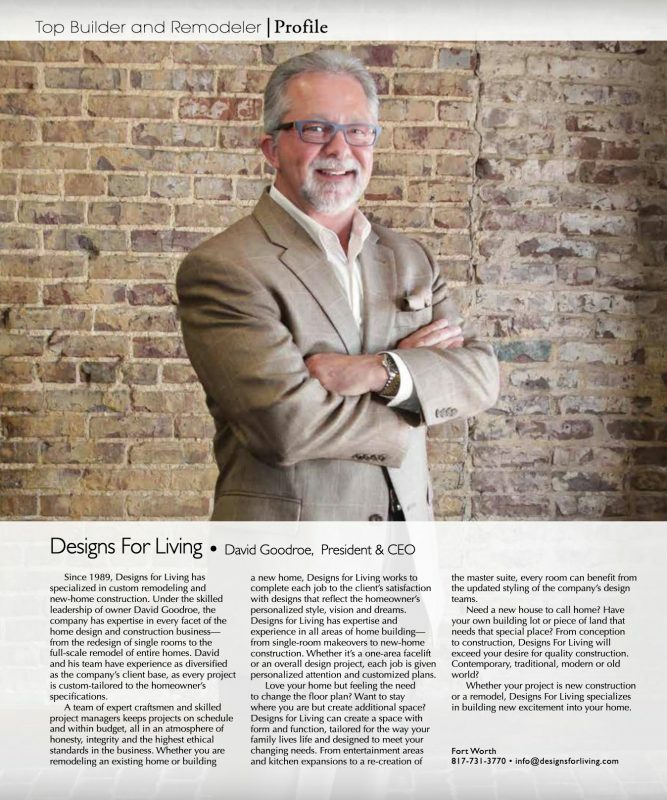 Under the skilled leadership of owner David Goodroe, the company has completed every facet of the home design and construction business—from the redesign of single rooms to the full-scale remodel of entire homes. David and his team have experience as diversified as the company’s client base, as every project is custom-tailored to the homeowner’s specifications. A team of expert craftsmen and skilled project managers keep projects on schedule and within budget, all in an atmosphere of honesty, integrity and the highest ethical standards in the business. Whether you are remodeling an existing home or building a new home, Designs for Living works to complete each job to the client’s satisfaction with designs that reflect the homeowner’s personalized style, vision and dreams. Designs for Living has expertise and experience in all areas of home building—from single-room makeovers to new-home construction. Whether it’s a one-area facelift or an overall design project, each job is given personalized attention and customized plans. Love your home but feeling the need to change the floor plan? Want to stay where you are but create additional space? Designs for Living can create a space with form and function, tailored for the way your family lives life and designed to meet your changing needs. From entertainment areas and kitchen expansions to a re-creation of the master suite, every room can benefit from the updated styling of their design teams. Need a new house to call home? Have your own building lot or piece of land that needs that special place? From conception to construction Designs For Living exceeds your desire in quality construction. Contemporary, traditional, modern or old world? Whether your project is new construction or a remodel, Designs For Living specializes in building new excitement into your home.